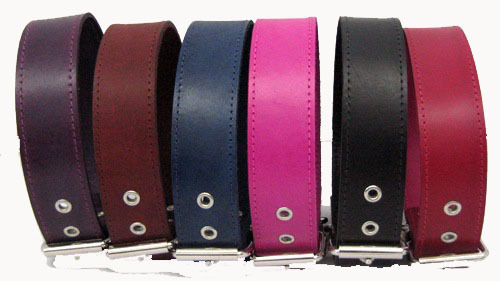 1 3/4 Wide Plain Leather Collars 1 3/4 Wide Plain Leaher Collars  - $25.00 : Your Pet Store, Made in the USA! Leather collars for large dogs made in the USA! These are 1 3/4" wide leather collars and are perfect for all medium to extra large breeds, including Pit Bulls, Bulldogs, Rottweilers, and any other large dog. We start with a hide of 8-10 oz Latigo leather, cut the proper width and length, hand dye each piece individually, and apply a water-resistant sealant. It is available in black, brown, pink, purple, red, or blue. We add spikes, jewels, or a combination of both, or leave the leather plain for your pet. The spikes and jewels are riveted onto the leather, so there is no chance of them being removed. The spikes are very sharp when we get them from the manufacturer, so we use a special grinding wheel to individually round each spike for the safety of your pet. For proper sizing, simply measure your dog's neck. Our measurements are accurate sizes for the size of your dog's neck. If you have a puppy that is still growing, it is best to order a collar that will fit the dog in the smallest hole so your dog will grow into the collar. For instance, if you have a puppy with a neck measurement of 18", order the 18"-22" collar. If you need a different size than what you find here, please email or call us--we can make any size! !